The Ferndale Area Chamber of Commerce and Ferndale Recreation present a day of affordable family fun at the 2012 Garden Fresh Gourmet Hilton Fall Festival on October 13th. Featuring music, kids’ activities, costume contests, pony rides, hay rides, inflatables, climbing wall, arts & crafts fair, and more; this spooktacular event runs 10:00 am through 5:00 pm along Hilton Road in Ferndale, MI. 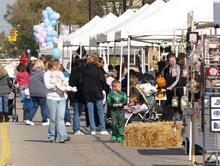 The 2011 Hilton Fall Festival boasted over 3,000 visitors and is growing in popularity each year. Family-oriented and Halloween themed, the 2012 Festival is a great opportunity for artists and crafters to sell their wares just ahead of the Holiday season. Art and Craft 10′ X 10′ spaces are available starting at $50 for the day.